Has a supergroup ever lived up to its classification? The best (Traveling Wilburys, Dead Weather) have been great at times, but to say that they were ‘super,’ better than the bands from which they came, would be foolish. “Handle with Care” was good, but one of those Wilburys wrote Blonde on Blonde all by himself. And another one was a Beatle. Ignoring the pasts of Jones, Homme and Grohl, then, we’ve got a debut album that’s fun and catchy with a light heart and heavy grooves, featuring extremely capable musicians each bringing his equal third to the pie. It sounds exactly like you might expect: Grohl’s drums are gigantic and ferocious, Homme’s guitar sprays unrelenting enemy fire, and Jones’ bass squirms like a hyperactive toddler in a carseat. The three pieces together make for solid, often punishing blues-based rock’n’roll—wonderfully grimy and served fresh and hot from the garage. 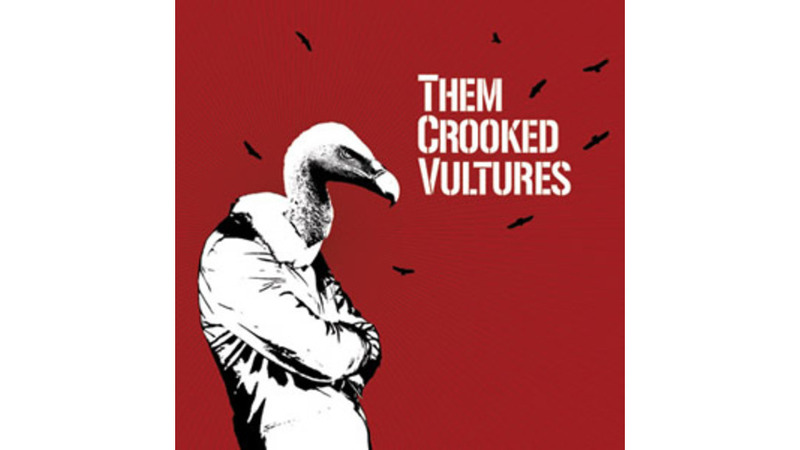 Them Crooked Vultures sounds best when they don’t toy with that formula; the experimentation gets messy. “Interlude with Ludes” sounds like a B-side from QOTSA’s Rated R—echoey vocals and faraway drums. “Gunman”s disco beat and taut rubber band guitar are unwelcome visitors. It comes together best with “New Fang,” four minutes of endlessly churning bass and pummeling percussion; a “Black Dog” for the new millennium. Tunes like “Dead End Friends” and the shape-shifting riffing of “Elephants” simply make sense—each musician doing what he does best in harmony with the others; nothing more, nothing less.